About – Host Lodge #6 F. & A.M. Welcome to the new online presence of Host Lodge Number 6 of Free and Accepted Masons, located in High Bridge, New Jersey. Host Lodge was formed in 1990 with the consolidation of three local Lodges of Free and Accepted Masons. 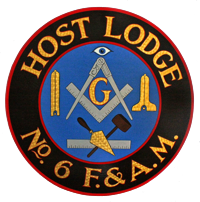 The name “Host # 6” comes from the names and number of the consolidated lodges: Hobart, Stewart and Lebanon # 6. Host Lodge holds regular communications on the first and third Wednesdays, September through June at the Host Masonic Center on the corner of Dennis Avenue and Ridge Road. We welcome traveling Masons at our communications. The gavel sounds at 7:30 PM.